I got an invite last night on Halloween eve to a great Halloween party at club Zero Gravity organized by Jasmine who is Bixyl Shuftan’s girlfriend. I was surrounded by spooky party goers in great costumes. It was packed. Bixyl told me Jasmine put a lot of work into the Halloween party designing the set and DJing the music. She did a great job. She played Halloween music old and new, and an extended mix of Michael Jackson’s "Thriller." The speakers were made of pumpkins. She set up a best in Halloween contest for 1000L or so for everyone, and then by surprise Nydia Tungsten the owner of Club Zero Gravity showed up and added 2,000L to the prize money making it a total of 3,000. I won a Halloween contest earlier that day as Guy Fawkes the revolutionary man in a mask from British culture. So I played fair and did not enter the contest wanting someone else to win. The prize winners were Kitacelia and Amaya. Looking through notices I saw ZZ studios was having a trick or treat event on Halloween day itself. That sounded like a definite treat. The notice explained that we could go to ZZ studios staff like Cindy Babii or Rhin Forti and say “Trick or treat!” The prize for saying that was a random ZZ studios trading card with various furries in adult themed clothing. The cards were from the Halloween season, so it was a nice treat. I myself am in one of these cards dressed in primitive clothing in loin cloths and spears paired up with Justin Foxchase. Finding Cindy Babii she looked like a zombie killer but she corrected me and told me she was dressed from the movie "Mad Max." I said “Trick or Treat!” and she rezzed an orb, which I clicked to get a random ZZ Studios card. When I wasn’t looking, Cindy tried to be sneaky and steal my car that I bought from a charity car show. (When I reported on the Hot Bay City car show earlier in the year) Luckily only I can drive the car, so Cindy was foiled in her car theft. I found Rhin Forti in their movie theater. Just like Shockwave’s movie night ZZ studios has a place to play movies. Rhin herself was dressed up like a piranha plant from the Super Mario brothers game that pokes up from pipes to bite those pesky Mario brothers. She also gave me another card through the random orb. For kicks I drove past the zombie house and saw a Halloween party going on so I stopped by and chatted a little bit through voice and text. Throughout the day ZZ Studios was playing Orson Welles’s "War of the Worlds," "Zombie Land," and "Ghostbusters" 1 and 2 in that order in their movie theater. Later in the Halloween day I got a teleport invite from Gemma to a Halloween party at the “Corner of Revolving Time.” DJ Qwark Allen was playing some cosmic and spooky psytrance. Gemma and Qwark were reapers with pumpkin heads, and I saw an avatar with a large skull head. Made me think of the show animanics and the character “Mr. 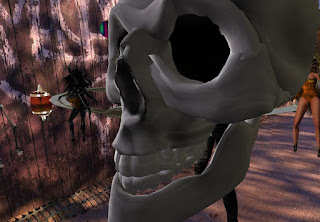 Skullhead.” A friend of mine ShinyWhiteDragon was at Qwark’s party wishing me well for Samhain, another word for Halloween as the pagan holiday when the veil between the spiritual world and the physical is at its thinnest. All in all I had fun partying with furries and humans for the fun holiday of Halloween. I didn’t get any chocolate or candy but I still had a lot of fun in SL’s various nooks and crannies.